Around 9pm yesterday evening, over 100 hours since polls closed, the result for the Bromley South ward in Tower Hamlets was announced. It brought to an end the longest count in a local election since, well, since the last one of similar ineptitude. But even now we still don’t know the full composition of Tower Hamlets council, as the vote in the ward of Blackwall and Cubitt Town has been postponed until late June following the death of a candidate. The outcome won’t affect the balance of power, however. Tower Hamlets will remain one of what are now two London councils in no overall control. Interestingly, both are hung councils not because of a good showing by all the main parties, but because of strong performances by local groups. Here, it’s Tower Hamlets First that has deprived Labour of a majority. In Havering, the other hung council, an alliance of residents’ associations deprived the Tories of a majority. Of those 20 Labour councils, five are gains (two from no overall control, three from the Tories). The five were Merton, Harrow, Redbridge, Croydon and Hammersmith & Fulham. The latter was remarkable and, certainly for me, utterly unexpected. Labour has turned a safe Tory council with a majority of 16 into a safe Labour council with a majority of 10. Of the 20 councils, I’d categorise 17 as now having a safe Labour majority (10 councillors or more). That’s up from 12 before the election. Over half (11) have no Liberal Democrat councillors whatsoever. Labour’s performance in London was very strong indeed, and the party will rightly be confident of vacuuming up a number of Tory and Lib Dem marginals at next year’s general election. All the same, the failure to win overall control in Tower Hamlets will rankle – as will losing the race for elected mayor of the borough. The Lib Dem vote collapsed spectacularly. This shouldn’t have been such a surprise, given this was the first time these councils had been up for election since the formation of the Tory-Lib Dem coalition government. The scope of the decline was unexpected, however. As well as being left with no representation on 11 Labour councils, the party has been wiped out of five Tory councils plus the two hung councils as well. That means a grand total of 18 Lib Dem-free boroughs. 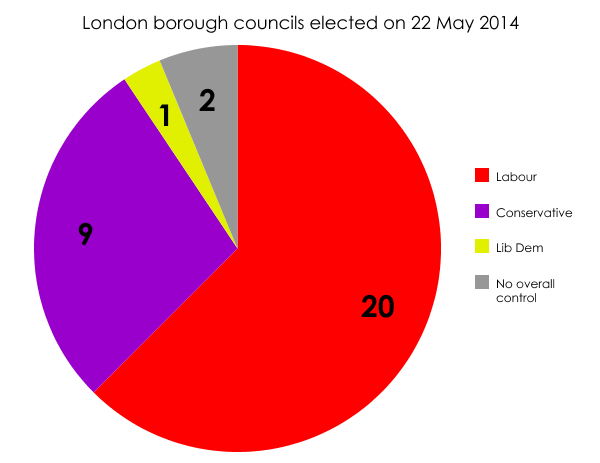 It has a total of 116 councillors in the whole of Greater London: roughly half the number it had before (240). And there are six councils where its representation has been cut down to just one person. There are really only four boroughs where the Lib Dems now have any real presence: Southwark, Richmond-upon-Thames, Sutton (the one council they control outright) and Kingston-upon-Thames, which they used to run but have just lost to the Tories. That one gain was the sole solace for the Conservatives amid a generally (though not exclusively) poor performance across the capital. Two parties were wiped out in London: Respect and the Socialist Labour Party. The former previously had two seats in Tower Hamlets; the latter a single seat in Barking & Dagenham. The SLP’s defeat means Barking & Dagenham joins Newham on the dubious list of councils entirely represented by Labour. Lewisham and Islington would be on that list too, were it not for the Greens winning one seat in each. Finally, Ukip. Much has already been written about how badly the party did in London, so I’ll just leave you with the figures. The party’s tally of councillors fell by almost a third, from 19 to 12. It is represented on only three of London’s 32 boroughs, all of which are on the eastern fringe of the capital: Havering (seven councillors), Bexley (three) and Bromley (two).